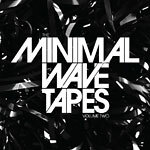 Minimal Wave: underground DIY electronic music from North America and Europe in the late 70s-80s. Characterized by 70's synth and early drum machine production and home recording, most of these tracks were privately released on limited-edition cassettes or vinyl and known only to a handful of people over the years. New Yorker Veronica Vasicka has spent the past five years painstakingly building the Minimal Wave catalog, and a label of the same name that specializes in digging up and reissuing the music. Partnering here with Stones Throw, the recordings have been officially licensed, remastered from their analog source tapes and compiled here by Vasicka and Stones Throw's Peanut Butter Wolf.